How to Fix – ERR_NAME_RESOLUTION_FAILED? What does err_name_resolution_failed mean? This error occurs when there is a problem with an internet connection or issue with firewall settings. The web page at https://tech-banker.com/ might be temporarily down or it may have moved permanently to a new web address. You may notice the error code 137 as well. ERROR_NAME_RESOLUTION_FAILED is common on Windows and, more especially, the Google Chrome Browser. There can be multiple issues behind this error. If you have installed any type of program that needs to communicate with the Internet Connection and this problem occurred just after the installation of that program then, the program you have recently installed can be a suspect to blame. If you don’t have installed any anti-virus software on your computer, then install it now! It must install on your computer, if you want that your system worked perfectly without any errors. There is a function in windows – Netsh Winsocket Reset, which reset the socket settings of the TCP/TP stack. This’ll resolve your problem. If this doesn’t work for you, I’ve other solutions to fix this issue. 1. Check the games or apps which requires the Internet Connection. By Default, Your PC is set to use internet settings configured on your modem or router. Your Internet Service Provider (ISP) provides the default settings & they remain the same unless changed. If the problem deals with the network configuration, just open the Command Prompt as an Administrator and run the following commands. 1. Open a Command prompt as an admin. 2. Run the following commands one by one. 3. After executing all the above commands, you must restart your computer. 4. After Restart the computer, Open the Google Chrome Internet browser and try to access the website. 1. Right click on the Network connection located at the bottom right side of the desktop. 2. Select the open Network and Sharing Center option. This will redirect you to a new window. 3. Click on the Change Adapter Settings situated on the left side on the window. 4. Then, right click on your Internet connection Properties. 5. A popup window will appear. 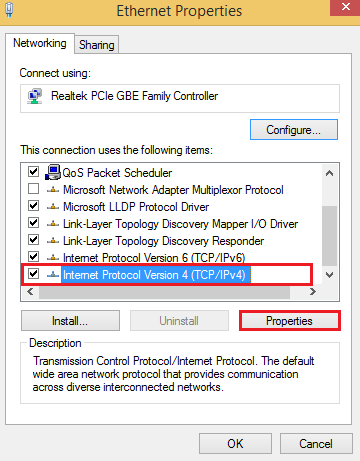 Here, choose Internet Protocol Version 4 (TCP/IPv4) and then click on Properties. 6. 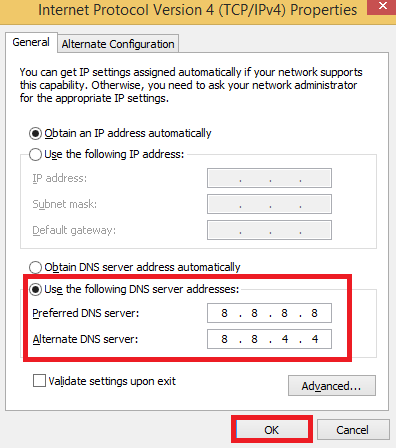 After that, replace your Preferred DNS Server to the 8.8.8.8 and Alternate DNS Server to 8.8.4.4 as you can see the following screenshot for better understanding. 7. Now, Click on the OK button. After making all the Changes, Open Google Chrome and see if the error still insists. If the problem continues, then proceed to the next method. 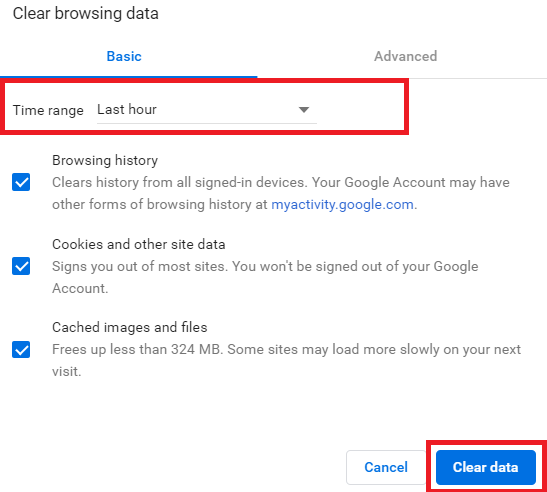 But before proceeding to the next method, you need to go over the previous steps again and this time remove the google DNS address. 1. Open Google Chrome. Type chrome://flags/ in the address bar. [without quotes]. 2. Hit the Enter button. 3. There is an option Reset all to Default as mentioned in the screenshot. Click on Reset all to default option. 4. Chrome will ask you to relaunch now. 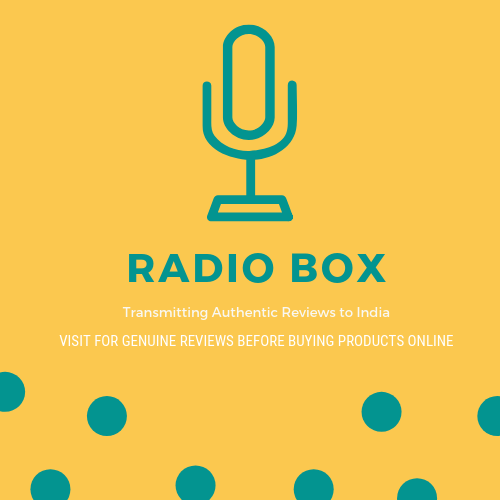 Click on Relaunch Now. 5. Last, Launch Chrome again. Have you done everything for resolving the issue but still, the problem has persisted, then clear the cookies and caches of the Chrome. 1. For Windows, press CTRL+Shift+delete to clear the browsing caches. A popup appears, click on Clear data. So, these were the different techniques to fix the Error. After applying all the above methods, if you’re not able to resolve the problem, Restart or Reset your router. If it doesn’t work, contact your ISP provider to know about the problem. I hope this helps you to learn how to fix this error.